Gardening is a pursuit I dream about loving. I don’t really love it. I just wish I did, because gardeners who do, achieve spectacular results. So far this year my attempts at garden beautification include spending a few hours weeding. 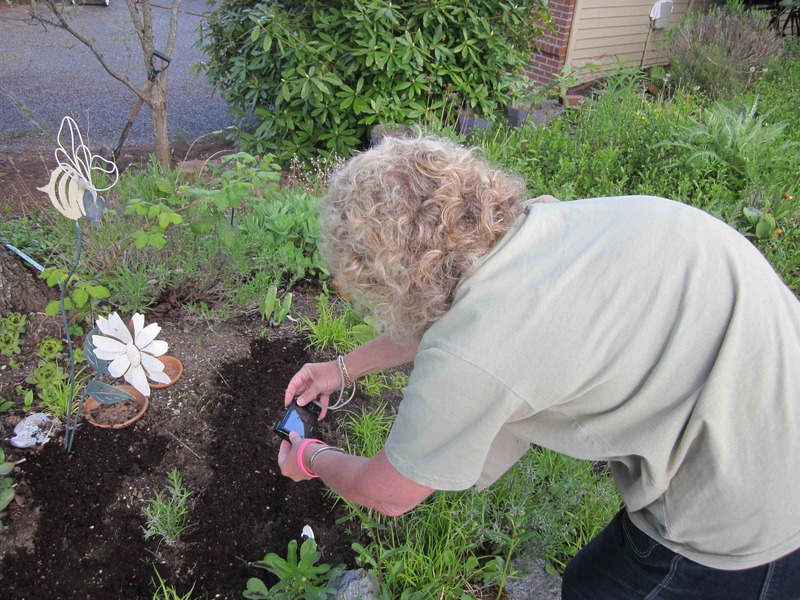 Regrettably, the weeds have all returned and brought friends and relatives with them. I also bought three gorgeous begonias that I set in a sunny place where their beautiful forest green leaves tanned too dark and crisped around the edges. Yesterday I checked these plants into recovery in a shadier area. Discouraged by these and other setbacks, I decided vegetables would be easier, from seeds no less. I planted carrots, two kinds of lettuce, spinach and radishes. I now have three lettuce plants an inch tall, four spinach with holes in them, and lots of radishes with half-eaten leaves. Maybe I thinned too soon. After assessing this bounty two months after planting, I decided that I should grow a vegetable garden in patio pots. My arugula seedlings look great. Too bad I rarely eat arugula, but if the plants survive past infancy I will add arugula to my menu. The one plant guaranteed to grow, and from seeds, is the lowly nasturtium. I count on its success every year. So confident am I that I told my friend Jackie, who said she had failed at growing anything, including nasturtiums, from seed that I would plant seeds in her garden and guarantee results. She has doubts. Below she is photographing the “before” scene. I know she’s expecting the area to look like a crime scene later, when no nasturtiums appear and she has a gaping space where I yanked out the perfectly good plants that used to bed there. However, I have no worries about succeeding in this endeavor. She travels a lot, so I can always check on the seeds’ progress when she’s gone and plant some fully developed flowers — whatever I need to do to prove myself right — to greet her when she returns. 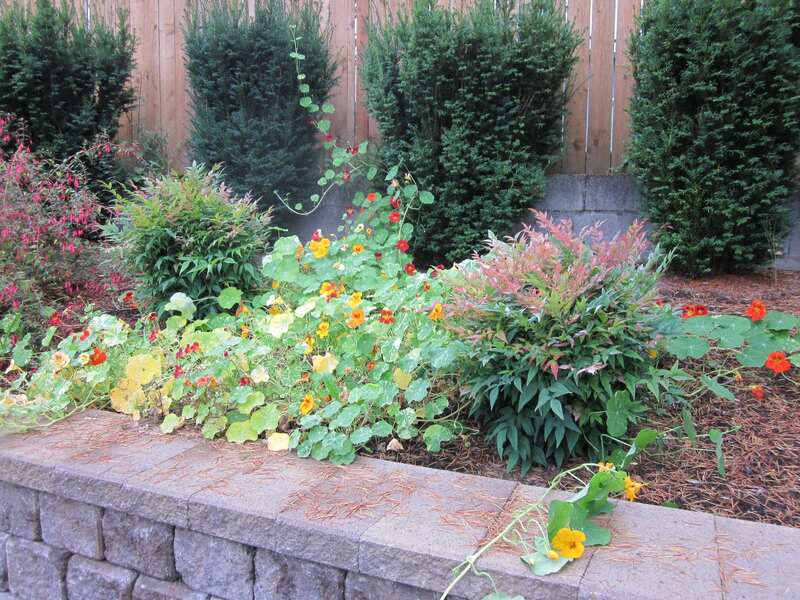 This entry was posted in humor, seasons and tagged gardening, growing vegetables, nasturtiums. Bookmark the permalink. I too wish I were one of those “green thumb” gardeners. Unfortunately, I don’t spend enough time to get to be one. I do have one plant that loves my yard and will grow everywhere!! It is the dandelion. This year I have an especially thriving crop – having had no time to even begin to start working out there. It is also hard to find any enthusiasm for it when my dandelion crop is so rampant. When they were yellow flowers, I tried to tell myself to see them as lovely plants – – or I could have harvested them and tried to make dandelion wine! (My parents did this one year – I don’t think anyone ever drank it though.) And the one year I planted nasturtiums (sp??) they were covered with black aphids.